I began Carol Dweck's book Mindset hopeful she would provide the clue to my eternal problem, getting from Here to There. "There" being across a chasm to where the *real* successful people are. I thought Mindset might prove to be that trompe l'oeil trick with different-sized circles that Jessica Witt (discussed in my last post) used to fool golfers into thinking the hole they're aiming for is bigger and easier to reach. A literary equivalent, a trompe l'brain or something. And in a way, it could be. Dweck's theory--backed by research--is that people tend towards one of two mindsets, (1), the fixed mindset, or (2), the growth mindset. According to Dweck, our predominant mindset "profoundly affects the way you lead your life." The basic idea is that folks with a fixed mindset believe people have a finite amount of brain power, a set personality, and an unchangeable moral character. The folks with a growth mindset feel that basic human qualities are elastic, can be cultivated, and are of an unknown potential that can increase through effort. So which mindset does Carol Dweck say leads to the most success, my scores of readers? Well, they both can. Yes, both mindsets can inspire people to great success. The fixed mindset is achievement-focused, and achievement-focused people often achieve stuff. And the growth mindset, which is all about encouraging development, also gets people to the top. But only the growth mindset can keep you going. Why? Because the fixed mindset is all about proving it's smart and special, which is fine motivation, I guess, for clawing your way to the top of your game (John McEnroe) or your company (Lee Iaccoca.) Once you get there, though, you become risk-averse. You have to protect your status, so challenges are things to avoid. Whereas the growth mindset is all about embracing challenges and learning from them. (Michael Jordan, or Jack Welch of General Electric) These guys are willing to work hard and aren't as invested in beating other people as they are in improving themselves. Since life, they tell me, is all about change, those who are more flexible are going to prosper in the long run. The good news is that you can change your mindset from fixed to growth. Are you surprised? So where does that leave us? She offers us some exercises to sort out our mindsets. Which I tried. I recognized both mindsets in myself. The book didn't make my goals look easier to reach, I'm sorry to say; but it did clarify my thinking on what I've come to call my Yoga Mat Realization. See, I practiced Ashtanga yoga for four years. Ashtanga yoga, in case you don't know, follows a set routine of poses (asanas). Everyone starts and ends the practice with the same opening and closing sequences. In the middle, though, you progress through several series of asanas. These asanas always go in a set order, and technically, you don't move on to the next asana until you've mastered the one you're on, and you don't move on to the next series of asanas until you've mastered all of the asanas in the series before. As I mentioned, I practiced Ashtanga for four years. And I never moved past the 1st, or Primary Series. Now this isn't that unusual, so I am sure I don't need to explain that during that time I was became pregnant with my second child and recovered from that pregnancy, so I won't bother...No, really, it's not that unusual. Many people never move on the the 2nd Series, let alone the 3rd or beyond. No shame, no shame. And anyway, we all know yoga is not a competition. So my point is, that one day on the mat, well into all those years of practice, I noticed that I was always willing to work and work at my practice, and I was happy if I improved over what I had done before. I was very comfortable in that position as student, practitioner, and striver. I now see that is an excellent example of my growth mindset. Yet the other part of my revelation was that all the time I worked on my asanas, after all the technique I acquired and all I learned about yoga philosophy, I always saw myself as different from whomever was at the front of the room, from the instructor. Well, it's one thing to see yourself as inferior to the instructor. But I also saw myself as somehow essentially different from, and yes, inferior to the advanced students who were "ahead" of me, doing their 2nd or 3rd Series. I felt as if they possessed some ingredient I lacked that allowed them to achieve that level. While no one told me I'd never get beyond the Primary Series, I just assumed that was as far as I'd go, because I lacked something fundamental that could carry me ahead. If that's not the fixed mindset, I don't know what is. But instead of having an inflated sense of my own worth, like Jeffrey Skilling at Enron--Dweck talks about his culture of intellect at Enron and so does Malcolm Gladwell in Outliers--I seemed to have a deflated one. So the final part of my yoga mat realization was that I could see myself approaching success but never reaching it, as if my life were one long asymptotic trajectory towards the axis of success. The asymptotic approach conundrum. Why don't we call it that. Which brings me back to that tromp l'brain technique I was hoping for in Mindset. I'm afraid nothing's going to work but a few small wins. Something that teaches me that just a little step is all it takes to step off that asymptote and hit the axis. Being at the front of the room is just a matter of practice and incremental growth--and which way your mat is facing. How did you develop this always-a-bridesmaid-never-the-bride mindset, Hope? If what it will take to undo it are a few small wins, but winning takes a can-do mindset...you see the problem? Oh, yes, I definitely see the problem. Now, how did I get this way? Long story short: difficult childhood, I suppose. But I may have a win to announce week after next. Check in! I don't know all the fancy (french?) words you have used, but I do know that I want to be more resilient. 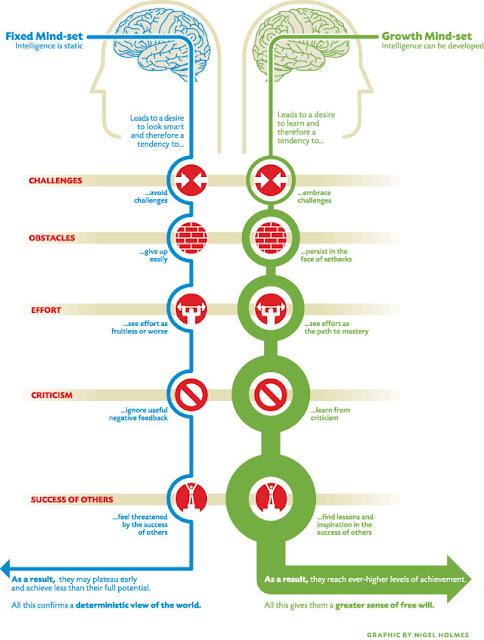 I like Dweck's work because it gives a structure and clarity to resilience as a mindset. And I so relate to the belief that life is about never actually getting "there". Andrew, thanks for your straightforward words. I agree with you. I like Dweck a lot. And the ability to enjoy the process of work/life is easier for me to appreciate after reading her book. Amazing Post.The most important element to success as a student or as a person is to have a growth mind-set,implying that paying little mind to how well you have the capacity to do something at first and foremost,you believe that with diligent work you can show signs of improvement.You believe that you will in the end succeed in the event that you keep trying.This has been ended up being more imperative than I.Q.,any other calculate determining success.Thank you. Thank you for reading and replying! I wish I'd learned about Carol Dweck sooner, but her advice is so helpful, regardless of age.